Many studies have shown that standing up for part of the workday can reduce back pain, improve blood circulation, increase your calorie burn, raise your energy levels and productivity. In addition, it can reduce your risk factors for cardiovascular disease, diabetes and high blood pressure. Using a height adjustable desk, you can switch easily from a sitting position to a standing one in mere seconds without interrupting your work. The height adjustable desks we will compare in this article can sit on top of your existing desk and are equipped with ingenious work-surface lifting mechanisms that allows you to switch from a seated to a standing position quickly and easily without interrupting your work, ensuring ergonomic comfort for your arms and shoulders whether sitting or standing. There are many brands available, but the two we will be considering are the two top brands in their category as shown buy the huge number of Amazon customers who have bought and praised them in their reviews. 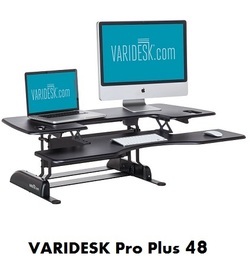 They are the VARIDESK Pro Plus and Stand Steady X-Elite Pro height adjustable desks. This article will compare VARIDESK Pro Plus 30, Pro Plus 36 and Pro Plus 48 with Stand Steady X-Elite Pro height adjustable desks. VARIDESK makes height adjustable desks of a number of styles and sizes. The VARIDESK Pro Plus desks were not just the most popular VARIDESK desks among Amazon customers at the time this article was written, but they had also received excellent reviews from most Amazon buyers (average ratings of 5 stars and 4.5 stars each out of 5 stars!). Stand Steady also sells a number of styles of height adjustable desks, but X-Elite Pro was definitely the most popular Stand Steady desk among Amazon customers at time this article was written. It had also received an average ratings of 4.5 stars (out of 5 stars)! Please refer to the APPENDIX section below for exact dimensions of the VARIDESK and Stand Steady desks considered here. VARIDESK Pro Plus desks have an ergonomic design that adjusts to most user's height and fit most desks in any office or cubicle. 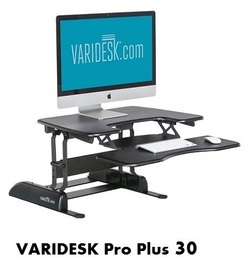 VARIDESK Pro Plus 30 is the perfect size for smaller workstations and those with single monitors (up to 35 lbs). It has a work surface size of 30” x 29.75” (keyboard tray and desk). VARIDESK Pro Plus 36 is the perfect size for workstations with dual monitors or docking stations. The 36” wide raised display shelf is roomy enough for two 24” monitors (up to 35 lbs). It has a work surface size of 36” x 29.75” (keyboard tray and desk). VARIDESK Pro Plus 48 is the perfect size for larger workstations and those with multiple monitors and workspace requirements. It is large enough for three 19” monitors or two 24” monitors and a laptop (up to 45 lbs). ​It has a work surface size of 48” x 29.75” (keyboard tray and desk). ​Stand Steady X-Elite Pro has a work surface size of 28” x 20”. It is designed to fit most desks and cubicles. Though you can fit two monitors on the X-Elite Pro, if they are not too large, it would better accommodate a single monitor and a laptop as shown in the above picture (up to 20 lbs). The two-tier design gives you an upper display surface for your monitor(s), and a spacious lower keyboard and mouse deck. VARIDESK Pro Plus desks use a patented two-handle design, coupled with a spring-assisted boost-enabled lifting mechanism that makes moving from sitting to standing quick and easy. This allows you to switch between sitting and standing positions in 3 seconds without breaking up your concentration. Note that the keyboard deck lifts with the display surface. These desks are height-adjustable to different positions for ergonomic comfort. 11 positions are available for all three VARIDESK Pro Plus desks, and their maximum extension height is 17.625” for the desktop display surface, and 14" for the keyboard deck. ​Note also that these desks remains sturdy and stable even when fully extended. Stand Steady X-Elite Pro desks are equipped with an innovative air pump system that allows you to switch between sitting and standing positions in 3 seconds, without any interruptions in your work. The height adjusts from 5 to 16 inches, and the desk can be locked at any position between its flat position and its max height. VARIDESK Pro Plus desks have a steel frame and durable composite particleboard type laminated surface. ​Stand Steady X-Elite Pro has a desktop made of laminated particleboard and the legs are made of steel. All four desks considered here come fully assembled right out of the box - no assembly, installation, or tools required! So which Height Adjustable Sit/Stand Desk is the right one for you? If you have a single monitor, you might want to consider either the VARIDESK Pro Plus 30 or the Stand Steady X-Elite Pro. Note that the latter can also easily accommodate a laptop next to the monitor. If you need space for more than 3 monitors or 2 monitors and a laptop, then you should go for the VARIDESK Pro 48 which offers the largest working surface. ​If you need space for 2 monitors, or a monitor and a laptop, then you might want to consider the VARIDESK Pro Plus 36 or the Stand Steady X-Elite Pro, but with the latter, if the two monitors are large enough, they may be too close or even somewhat overlapping. In either case make sure that you do not go over the specified limit of maximum load. Otherwise the lifting mechanisms may not work properly and you may have stability problems when the desk is fully extended. Most users will need enough space for a monitor and a laptop, and therefore will fall into case 3 above which explains the overwhelming popularity of Stand Steady X-Elite Pro and VARIDESK Pro Plus 36 which were the best sellers in their category at time this article was written. If you prefer a two-tier desk that gives you an upper display surface for your monitor and a lower deck for your keyboard and mouse, then you should consider one of the VARIDESK Pro Plus products. But keep in mind that you'd be saving quite a bit of money by opting for the Stand Steady X-Elite Pro, even if it does not have the two-tier design. Finally, it is important to emphasize that prior to your selection, you should consider well everything that you will need to have on your desk (including monitors, laptop, mouse, books, etc.) and make sure that the dimensions of your selected desk detailed in the APPENDIX section below as well as the maximum load specification described in Note 2 above are compatible. ​Please click the height adjustable desk of your choice below for price information or to purchase.